Magnum Systems has engineered, designed and manufactured quality pneumatic conveying, weighing, filling, and packaging automation systems to handle dry bulk solids such as; concrete, limestone, grout, bentonite, clay, salt/ice melt, asphalt, charcoal, coal, metal compounds, pellet fuels and other aggregates. We have served various markets since the 1960’s and our extensive product offerings in pneumatic conveying and packaging equipment has provided our vast customer base with reliable, proven systems they can count on to keep their process moving. We have conveyed, stored, packaged, batched, weighed and filled products from ash to zinc. Project Scope – Provide a complete packaging system for filling and palletizing of 50lb (22kg) bags, including an external material loading hopper, Incline auger packaging machine, bag sealer, conveying, and Robotic Palletizer complete with Stretch Wrapping station. Solution Overview – The system had to fit into an existing building but the kicker was the material needed to be introduced into the packaging system from outside the building where it was delivered by a dump truck. So Magnum Systems determined the best layout for the packaging line internally while being able to overcome the external obstacles. The solution was to install the product loading hopper on the outside of the building to be filled by a front-end loader in bulk. The hopper featured an inclined trough conveyor extending through the sidewall of the building and into the packaging line. 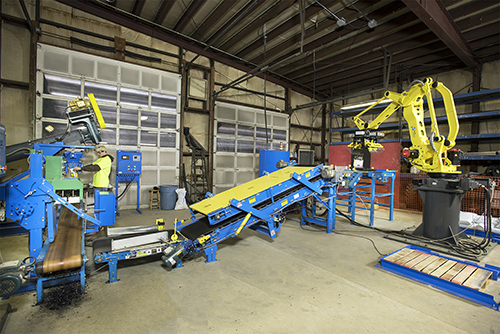 The packaging system featured Magnum Systems TRP3000 Robotic Palletizer with two palletizing stations, once palletized the operators transfer the stacked pallet to a Shrink Wrapping station for final preparation and shipment. Project scope – Dense phase conveying systems for sand and cement; Dilute phase conveying systems for silica flour and calcium carbonate. Includes Dense phase vessels, air management system retrofit, diverters, bin vents, and controls. Solution overview – The customer manufactures grouts and mortars. Smoot company installed two new dense phase systems and retrofitted an existing system to eliminate boosters and increase rate. Also, diverters were installed to allow the material to go to a new mixer in addition to the existing mixers. 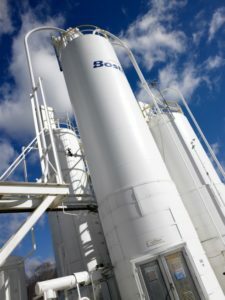 Weighing systems were placed on either the pressure vessels for the dense phase systems or receiving bins for the dilute phase systems to promote batch accuracy and speed of mixing cycles. Project Scope – (2) Dense phase ASME code vessels, control system, bin vents, large hopper, Dust collection, rotary valves, vacuum dilute reclaim system. (3) Impeller Packers, conveyors, robot placer, check-weigh, ink jet printing, robot palletizer, pallet dispensing and conveying, stretch hood machine, gravity accumulation. Solution Overview – The customer built a new facility to import Barite and grind it to a specified particle size to sell their customers. Dense phase pneumatically transfers barite from (2) milling/grinding locations to (4) silos across the plant. Barite was then transferred to multiple 50 lb & 100 lb bagging stations. Robots placed empty bags on to impeller packers to be filled. Once filled, the bags were moved on roller conveyors to be palletized by a robot. Once pallets were full, they were transferred to a stretch hood machine for transport to the oil field. Dust collection and reclaim systems were installed to reuse material. Project Scope – Vacuum blower, filter receiver, rotary valves, knife gate valves, hoppers, multiple vacuum pickup points, and an inlet filter. Solution Overview – The customer had problems with mechanical conveying breaking down. The time and cost to repair were costing the customer business. Magnum Systems proposed a pneumatic system to take bulk and minor additives to storage or a mixer. The vacuum system conveyed the additives up to a filter receiver located above a mixer. This provided a more reliable means to transfer the material reducing equipment failures. Project Scope – The customer wanted to get rid of troublesome screw conveyors while moving their mix tanks further away. Magnum Systems recommended going to a vacuum conveying system to keep the area cleaner and to get the specified rate to the tanks now 150’ away. Bulk pneumatic transfer, control system, filter receiver on load cells, rotary valves, vacuum blower were provided. Solution Overview – Pneumatically transfer Talcum Powder from a silo across the plant to a filter receiver located above two mix tanks. Talcum was vacuumed from a bulk silo across the plant to filter receiver. Once the filter receiver reached high level, pneumatic conveying was stopped. Talcum powder was then weighed and a specified amount was discharged through a rotary valve. The loss in weight was measured until the desired amount was reached.